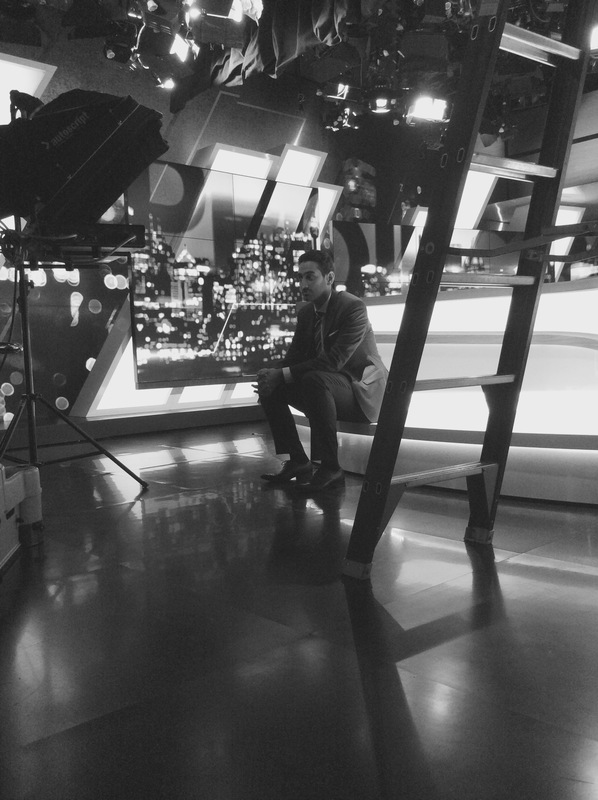 Waleed Aly on the set of The Project. WALEED Aly’s clash with Steve Price over the Adani mine on The Project this week got pulses racing among armchair devotees of the #idosohatethosenastyshockjocks and #iluvsorstraya hashtags everywhere. Depending on the cut of your ideological jib, Price was either the right-wing shock jock deservedly “shut down” by Aly or the righteous upholder of all things Team Australia who stuck it to the lefties. As television, it was enthralling because it was real. There was genuine contempt in Aly’s eyes during the exchange, fury in Price’s. It was death stares at 10 paces — or via satellite, actually, Price was being beamed in on the night, possibly from another planet. He usually sits a couple of chairs down from Aly. Who knows what might have happened if they’d been in spitting distance of each other. Dry cleaning bills, possibly. The mood of the discussion was already dark as they talked about the government’s proposal to strengthen legislation to prevent green groups from “sabotaging” (the government’s word) major mining projects by challenging them in the courts. Price was in favour of the mine going ahead at just about any cost; Aly wanted to dissect the argument that favours additional legislative curbs. But it was when Aly insisted on correcting Price’s version of how many jobs Adani would create that the mood turned toxic. Price said it would create 1500 to 10,000 jobs. (He said “jobs” so many times you’d think he was on the government’s group mailing list for daily talking points.) Aly insisted it would be fewer than 1500. His source? The company’s own expert, who conceded in court the mine would create just 1464 jobs. Price would have none of it and twisted and turned his position so that the value of the project no longer rested on whether it created 10,000 jobs – just 10 new jobs would make it worth going ahead, he said. Endangered reptiles and the requirement for correct process by the Environment Minister be buggered. Price was annoyed at being corrected for quoting the overblown figures and did his best to keep spinning them to support his point. Aly was annoyed that Price continued to make his argument after having his “facts” cut out from under him. It clearly offended the rationalist in Aly. And this is where we get to the nub of the thing. This kind of public debate, where people from ideologically opposing positions joust and jostle about a political issue, is an uneven contest. In fact, it’s not really a contest at all – not in the sense of being contested on a level playing field where the stronger argument wins – because the two sides are playing by different rules. Yes, Aly had the facts on his side (as much as facts mean anything; that’s a discussion for another day). But debates such as this one aren’t about facts. They’re about opinion based on emotion, and opinion based on emotion is immune to contradictory fact and all other rational argument. To shock jocks, the world is black and white, in their gut they know that to be true, and to see nuance or to concede exceptions to absolute certainty is weakness. To the deep frustration of their opponents, that world-view is about having a gut feeling or knee-jerk ideological position, finding whatever you can to support your position and sticking to it come hell or high-falutin’ argument. Shock jock opinion, they feel, is impervious to reason. This is especially grating to Aly, whose hallmark is his rigorous academic approach to dissecting ideas and arguments and the rhetoric used to prosecute them. He demonstrates this ability in everything he does, from his Walkley Award-winning columns for Fairfax, to his weekly radio program on Radio National, The Minefield, in which he and co-host Scott Stephens tackle the ethical dilemma of modern life, to challenging a shock jock for using dodgy figures in a TV discussion of an important issue. On The Project, Aly is a public intellectual in prime-time clothing. His ability to cut through an argument with clarity and precision is a rare and valuable thing. Price has form as the odd man out on The Project. He plays the role of the sacrificial right-wing voice who holds all the usual positions on all the usual issues and is a lightning rod for the other panellists’ ire. He’s anti asylum seekers, anti gay marriage, anti breast-feeding in public, anti calling anyone who booed Adam Goodes racist. He has clashed on these issues on the show with Charlie Pickering, Dave Hughes, Carrie Bickmore and Peter Helliar, respectively. He’s also anti being convinced by anything, no matter how solid the argument, that contradicts what he already believes. If we’re honest with ourselves we’ll admit that we all do this. It’s called “confirmation bias” – the tendency to have the opinion first and then look for the facts and arguments to support it later. I’ve done it throughout this comment piece. We’d also – while we’re being honest with ourselves – admit that how we see the clash between Price and Aly says something about our own ideological positions. Was Price “shut down” by right-thinking Aly? Or was he justly standing firm on what he believes in the face of nit-picking opposition? Your answer should tell you something about which game you are playing in the contest of ideas.